“For Windows, Install Driver First” NOTE: Backward compatible with Thunderbolt 2 Macs using Thunderbolt 3 to Thunderbolt 2 adapter Controller Architecture 1.2 GHz dual core ROC for RAID core and SAS microcode 2GB on-board DDR3-1866 SDRAM with ECC protection Redundant flash image for adapter availability System status indication through LCD, LED and alarm buzzer RAID Features RAID level 0, 1, 1E, 3, 5, 6, 10, 30, 50, 60, Single Disk or JBOD Multiple RAID selection Support up to 1MB stripe size Online array roaming Online RAID level/stripe size migration SED (self-encrypting drives) function support Support global hot spare and local hot spare Instant availability and background initialization Advanced configuration for smooth data streaming Disk scrubbing/ array verify scheduling support Multiple pairs SSD/HDD disk clone function SSD automatic monitor clone (AMC) support Support HDD firmware update Complete configuration management suite - McRAID manager – browser-based management tool (LAN or Thunderbolt) - Push Buttons and LCD Display panel for setup and status - Command Line Interface (CLI) – scriptable configuration tool - API libraries support – combine GUI with user management utility - SNMP support for remote monitoring - SMTP support for email notification Function Advantages Advanced Configuration Provide optimized parameter to adjust controlled firmware behavior for smooth data streaming. Controller-level Hardware Encryption Board-level hardware encryption manages any kinds of drives attached to ARC-8050T3 without impacting the performance for higher levels of security. BBM Support Support a battery backup option that protects all data in cache memory in the event of unexpected power outage. Intelligent Power On/Off Function Turn ARC-8050T3 power in unison with the host computer power status for data integrity. Front Panel LCD and Buttons Easy access for configuration and status report. Network Interface Embedded web server for remote control from one 10/100/1000 Ethernet (RJ-45). Bootable Drive Support Provides user the capability of adding bootable drive via Thunderbolt on Apple thunderbolt-capable machine. design Although a little dated, the casing is very compact and certainly more manageable than giant devices like the Promsie Pegasus 3. It is very functional and with two rear fans will keep the device cool throughout. Additionally, the inclusion of a real time LCD panel to give you information about the health and status of the drives is an excellent touch from Areca. features With blisteringly fast Thunderbolt3 as the connection of choice, the is going to be easily one of the most affordable 4 bay TB3 DAS enclosures available on the market. Likewise with control over the system and information from that front panel and RAID 0, RAID 1, RAID 5, RAID 6 and RAID 10 being supported, you are looking at a great TB storage solution. 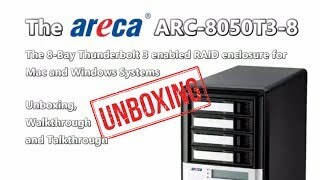 performance With the inclusion of a dual core ARM based RoC (RAID on chip) as well as 1GB of memory (twice that, in both regards, to their nearest rivals) it is in sheers performance and speed that the Areca ARC-8050T3-4 really shows it's power! design This black and silver chassis may appear a little dated in design and a combination of plastic and metal may put some off. Likewise the two fans are a pinch noiser than other DAS storage enclosures. Though you can turn the fans off. features With just Thunderbolt 3 ports, you will not see additional access like USB 3.0 to fall back on for non TB3 enabled PC or Mac devices. value Those unfamiliar with the areca brand may seek refuge in well known brands like Promise and WD. However I would recommend Areca as a long standing and reliable company for your storage needs. If you buy this Areca Thunderbolt3 RAID Enclosure and hard drives we do free build and test for the unit and hard drives. So you can use this device straight out of the box. All free of charge in ARC-8050T3-8 price. Top of the range, super speedy, fully thuderbolt 3 set up, high performance, zoom, zoom, zoom!! !